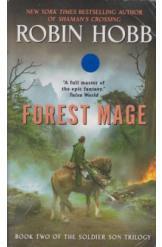 Forest Mage by Robin Hobb Sci Fi, book two of the Soldier Son Trilogy. The book is in a very good conditon, all pages intact. In this book the intriguing saga of Nevare Burvelle continues with his astonishing recovery, defeating his sworn nemesis and now journeying home to Wideva le.